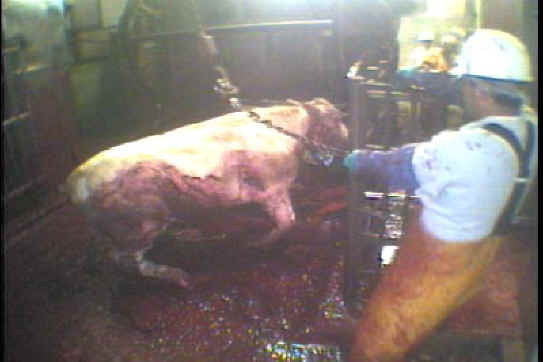 (Cattle Exploitation - Beef - 16) This a still from the undercover video taken by a PETA investigator at AgriProcessors kosher slaughterhouse in Postville, Iowa. 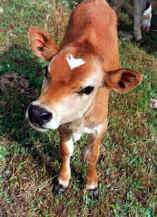 "The cow was loaded into a machine that resembles a large metal tube. His head stuck out of the front, then a metal bar clamped under his neck and forced his head upwards and back, cocked in an awkward and painful-looking position. The entire machine rotated, turning the cow upside-down. This process seemed to terrify him—his eyes were wide with fright—I imagine because he had never been in such a helpless position."